Click here if you haven't signed to Piano Playground, our free E-zine yet make sure you do that in order to get the username and password codes for the Leonard Cohen Hallelujah Piano Tab I provide here under. Here's a piano tab to help you practice the song the way we've played in the piano tutorial. 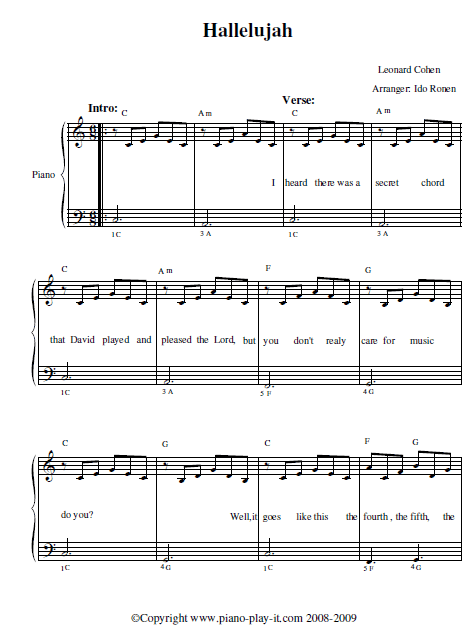 Click here for a free printable piano tab of the Leonard Cohen Hallelujah Piano Tutorial. The biggest problem you face when trying to play a song smoothly is that you have to be able to remember all the chord shapes and switch between the different chords fast. The goal of learning to play the piano chords quickly could be achieved much faster with the help of the Rocket Piano Learning Kit that will help you to train your fingers to automatically remember all the chord shapes, in 1/3 the time! 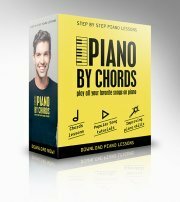 You'll learn all about how your brain processes information, and how to maximise your piano practice time... (nine out of ten people are absolutely floored by this secret!). Click here to check out the Rocket Piano Learning Kit Now!